It’s the same bowl of cereal. The same piece of toast. The same thing, day after day, it seems or the normal south Indian breakfast like dosa, puri ect. 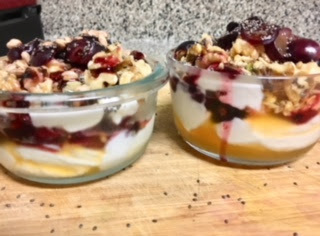 That’s why I love mixing it up with these delicious Berry Yogurt Breakfast Parfaits for a grab and go breakfast on the run. If you are anything like me, you are rushing out the door as fast as possible and thinking about breakfast is pretty much the last thing you want to do. Every single morning is a race against the clock. Trying to get two kiddos up, dressed and out the door by 8 am is a battle in itself. Boy, oh boy, is it usually a battle. oth my son and daughter usually laying in their bed refusing to get out of bed. Once out of bed they refuses to exercise and get dressed. Once dressed refuses to have breakfast. Non stop complaining - "Im still sleepily ", Not hungry", "Same breakfast" and it continues, By the end of the ordeal I often times feel like a I ran a marathon. Getting them off to school and relaxing with a cup of coffee is a welcome relief! 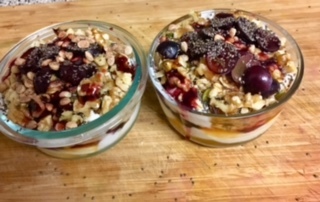 Lets' forget about my daily morning outburst and get back to my Greek Yogurt Parfait. I love fruit. I love yogurt. And I certainly love granola. 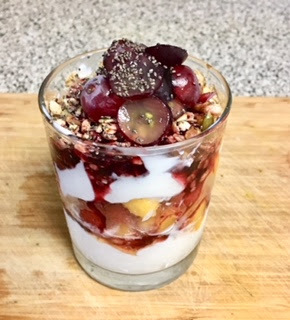 So I decided to aim for a healthy-ish version of a “fruit and yogurt” parfait to make at home. 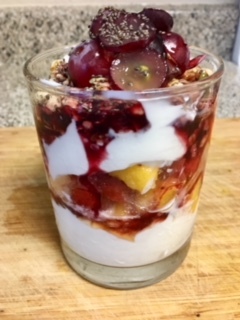 Breakfast is one of my hectic times of the day in our house as kids always racing out the door to beat the school bell!When I think of a Fruit and Yogurt Parfait, I think of Mixed Berry. I’m pretty sure this is the most common combo, but for good reason. Raspberries, blueberries, granola, and lightly sweetened yogurt layered snugly in a mason jar. Got no time for breakfast in the morning? Here’s your solution. These Greek Berry Yogurt Parfaits literally couldn’t be any simpler. Yogurt, Berries (fresh or frozen)and top it all off with a little granola and chai seeds. 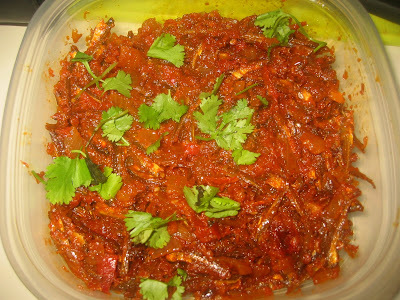 Best part, as long as you are selective about the ingredients you include, they pack a strong nutritional punch! In a small bowl, mix Greek yogurt and maple syrup and honey until well mixed Rinse and pat dry the blue berries and strawberries. Cut the strawberries into pieces. Layer yogurt, strawberries, blueberries, and granola on a tall glass or glass bowl of your choice. You can layer as much of each ingredient as you please. It's really a personal preference. This is how I layer it: 2 tbsp Greek yogurt, berries, 2 tbsp Greek yogurt ,granola, chopped walnuts. Finally drizzle the sauces and add the sliced grapes on top with sprinkles of chai seeds.